COX'S BAZAR, Bangladesh, Dec 14 2017 (IPS) - Twelve-year-old Rubina still struggles with the horrors she witnessed in her homeland in Myanmar before fleeing to neighbouring Bangladesh three months ago. Despite reaching the relative safety of a refugee camp at Kutupalong in Bangladesh’s southeast town of Cox’s Bazar – now home to nearly a million ethnic Rohingya people, mostly women and children, who fled military persecution in Myanmar – Rubina suffers from post-traumatic stress caused by the harrowing experiences back in her country. “Barely a night passes without nightmares,” she told IPS at an Islamic school in the camp where she comes every day to learn the Quran. Rubina was orphaned in the latest spate of violence in Myanmar’s Rakhine state. She fled to Bangladesh along with her grandparents and three siblings after her parents were hacked to death by local Buddhist people in the presence of the army. Rubina is among thousands of others who endured similar ordeals. Different NGOs and aid groups are now working in more than a dozen camps stretching from Teknaf to Ukhia in Cox’s Bazar. A 45-kilometre drive reveals settlement after settlement, with thousands of bamboo and tarpaulin shanties lining both sides of the hilly road. Nur Mohammad, 12, witnessed soldiers killing his father. 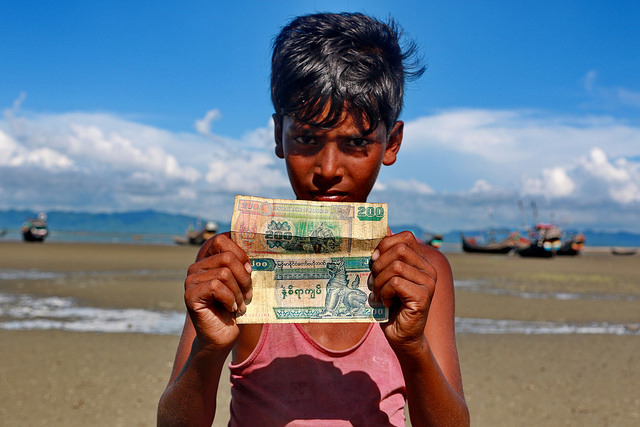 “My father, a fisherman, tried to escape by running away, but the military chased him and shot him to death,” said Mohammad, who was staying at his maternal grandparents’ house in Shahporir Dwip. Mohammad’s father was a Myanmar national and his mother was Bangladeshi. 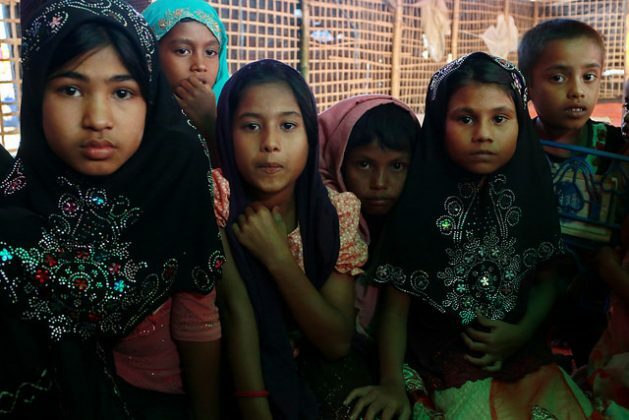 The latest figures by the International Organization for Migration (IOM) indicate that 647,000 Rohingyas have arrived in Bangladesh since the latest spate of violence in Rakhine that began in August. The Bangladesh government estimated 300,000 to 400,000 Rohingyas were already here before the current influx. 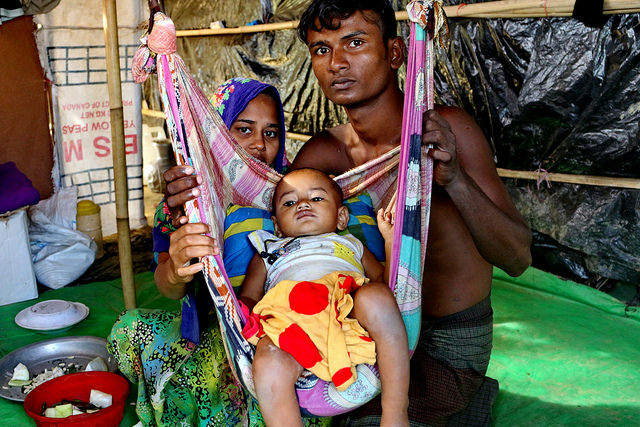 A Rohingya community leader, Dil Mohammad, now lives in a camp in the no-man’s-land between Bangladesh and Myanmar at Tambru of Naikhongchhari in Bangladesh’s Bandarban district. He told IPS that women and children were the worst victims of violence. Dil Mohammad, who has a degree in psychology from Yangon University (1994), worries about the future of those children, and especially young women, who will carry emotional scars from their experiences. Though the Myanmar military denies it, many rights groups and UN officials have confirmed deliberate and planned atrocities, including murders, gang rapes and arsons against the Rohingyas. “In most cases, children saw the brutality and the wrath of military against the Rohingyas, but many women were also showing the signs of brutality as they were raped and abused by the military and others,” said a Rohingya man, Mohammad Faisal, at a settlement at Teknaf Nature Park and Wildlife Sanctuary. Faisal’s teenage wife Hajera, who was expecting her second baby, said they were lucky to have escaped with other family members, and everybody was safe and alive. In most cases, women were unable to share their experiences with others, she said. “They can’t tell people how they have been abused, so they will bear their trauma [in silence],” Hajera said. An aid worker at a centre of Save the Children, who asked not to be named, told IPS about the children she worked with. “They come here and spend the whole day making new friends and playing with them, but they need time to recover fully,” she said. As women and children were the primary victims, women and children from their community should be engaged, along with the experts, so that the victims can speak up without inhibition, she said. For women, trauma and sexual assaults are not the only issues to be addressed. In this vast stretch of unprotected settlements, they face other risks, from hygiene, and sanitation to trafficking. Rohingya people interviewed for this story didn’t fear the type of attacks they faced in Myanmar, but said there were still opportunists who would try to exploit the helplessness of the Rohingya women and children who were struggling to survive. “Besides systematic aid work by groups with expertise, community participation is essential for the protection of women and children,” Professor Siddiqui stressed. Bangladesh and Myanmar recently signed a deal regarding repatriation of Rohingya. Many see the step as a ray of hope, but others who have suffered from decades of poverty, underdevelopment and sectarian violence at home were more cynical. Where are these people originally from, and when did they become Muslims? We think we know where the Roma “gypsies” originated from, but they claim no homeland. We know the Jews were stateless for thousands of years, but always claimed the Land of Israel or Palestine as their homeland. What is the full story with the Rohingyas?